A young suitor tries to attract your important characters to his kingdom to collect as much gold as possible. Try to keep your crown to win the game. Place the 8 location cards numbered from 1 to 8 A faces (or B faces) visible in front of you. Your character cards will be placed below and the character cards of the young suitor will be placed above. 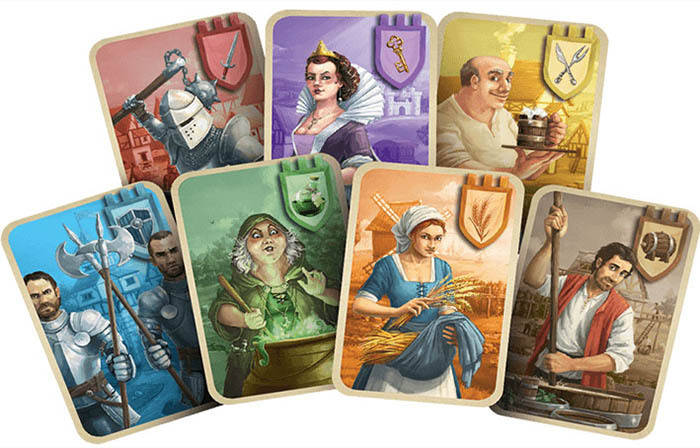 Arrange 8 random green-back characters cards face-up (from left to right) and place the full deck of red-faced character cards face-down on the right side of the 8th card. For the young suitor, form a deck of 16 location cards (8 A faces and 8 B faces). Mix this deck well. For your turn, apply the usual rules for characters but take seven Meeples instead of five. The young contender is the first player. You must read the cards from his deck to take a character in the population. In order not to know which character card the young pretender will take, discard the rst location card and read the second location card number to take the corresponding character card. For example, if the location map is numbered 4A; you will take the character card in 4th place (for double cards, A is the top character, Bis the bottom character). In the second round, you will discard the second location card and you will read the third location card. Each turn increases that count. Replenish the stack as needed. The young suitor does not install Meeples and does not collect the Meeples shown on the location cards. On character cards, the Meeples will be discarded by the young contender. 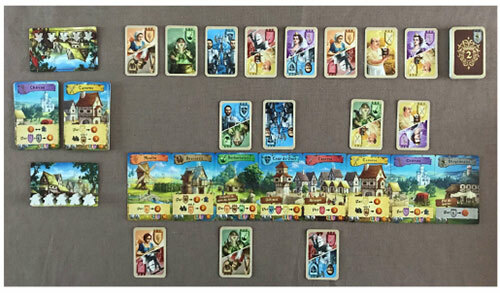 End of the game is reached when the last red-backed card was revealed and the player performed his action. Calculate scores as per rules.